Italy. Land of la dolce vita and high style, Ferrari, Lamborghini, women's pumps, designer leather, Sonus Faber and Unison Research. China. Land of mysteries, the last emperor, one of the world's most famous cuisines, home to Peking's Forbidden City and Opera Audio's newest visual statement in audio componentry. Who woulda thunk. Just as the Japanese automobile giants were once accused of merely copying the West only to create in the Toyota Corolla America's best-selling car for years in a row, so the Chinese audio industry is no longer content to be pigeon-holed for cheap labor and mass-produced copies of European designer goods. 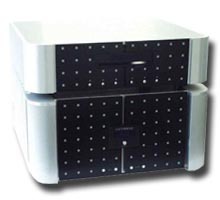 The defense presents exhibit A: Opera Audio's new Turandot CD player and Calaf 200wpc hybrid integrated with 6922-based driver section and 40-watt Class A operation before switching into Class A/B. The Calaf offers five remote-switchable inputs (one of them balanced); one set of single-ended pre-outs; damping factor in excess of 1000 and a S/N ratio of 100dB. An optional MM/MC phono board is in the works. List price? $3,200. The Turandot balanced tube CDP uses Burr-Brown PCM1792 DACs, offers less than 14ps of distributed jitter and a S/N ratio of better than 120dB. It sells for $2,400. Different finish options include the red/silver shown and a black panel with red squares and black body. 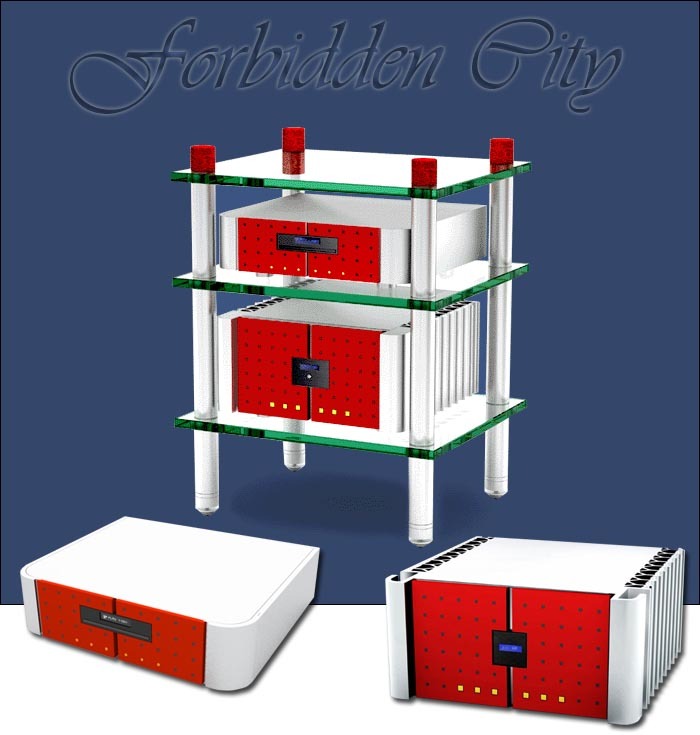 Additional Forbidden City components are in the works including a tubed processor. While beauty remains in the eye of the beholder, nobody can accuse Opera Audio of remaining content with same old black me-too packaging. And yes, there's child labor and environmental abuses and the Tibetan dilemma. And yes, there's Enron and Katrina and Iraq and bushes in need of exfoliation. Whoever wants to point fingers better be sure his home front is clean across the board. The defense rests its case. And as an expose of future hearings, how about Opera Audio's new hornspeakers? 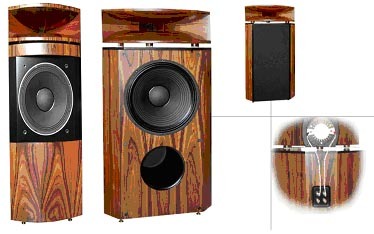 The M-12/M-15 specifications cite 38/30Hz bass extension respectively; 97/98dB 8-ohm sensitivity; 12"/15.2" woofers; 20.4"/28.8" Tractrix tweeter horns; wood-veneered MDF cabinets; 500Hz crossover points; 100/150 lbs weight ea. ; 37.2" x 16.6" x 18" HxWxD and 43.4" x 23.2" x 18.3" dimensions; and pricing of $5,900/pr and $8,500/pr. Availability? March 2006.